With the HM5, the Horological Machine 5, the premium manufacturer MB & F launched by the founder Maximillian Busser an elegant timepiece, whose appearance is far from traditional designs. For the design were both legendary Amida digit Rend and the design of classic sports cars of the 1970s, Godfather. 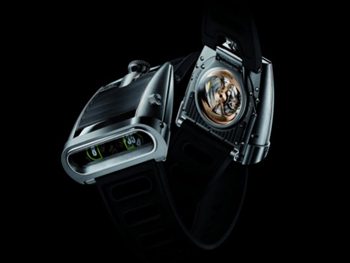 Even the housing of the MB & F HM5 is a tribute to the legendary design of classic sports cars. The upper part is reminiscent of the rear part of a Lamborghini Miura with vents. But unlike the car the openings serve as a direct light inlet in the housing of the zirconium-limited to 66 copies, Clock. By opening and closing the screen at the MB & F HM5, the brightness of the two SuperLuminova displays for hours and minutes can be regulated. In contrast to classic and traditional watches MB & F uses two dials that are not reflective sapphire crystal from above, but, as with the Amida digit Rend, read sideways. Responsible for this is the convex lens at the Lichteinlassen. Another feature of the MB & F HM5 the shape of the housing. This is specified by the dials, but only by the developed by Jean-François Mojon and Vincent Boucard clockwork. Particularly impressive is the golden rotation body having, as with the HM1, the shape of an ax. The work of HB & F HM5 offers a power reserve of 42 hours and consists of a total of 224 parts.